You can't discuss the slide in South Carolina football success since 2013 without discussing recruiting. The main narratives about why Gamecock football collapsed have centered around Steve Spurrier being too old and too lazy to be an asset in recruiting, along with the coaching staff being uninterested in putting in the required work to recruit at a high level, resulting a precipitous drop-off in talent on the field. I want to take a look at some data to see if we can prove this to be true. Rivals team recruiting ranking from the years 2002 to 2017 for all SEC East teams as well as Clemson. South Carolina has only had two classes in the past 16 years outside the Top 25, with the worst ranking coming in Lou Holtz's final season and the 2nd worst being after the coaching transition in 2016. The Gamecocks have been very consistent in recruiting since 2002, being the 3rd most consistent team over the past 16 years, and the 2nd most consistent team over the past 5 years. 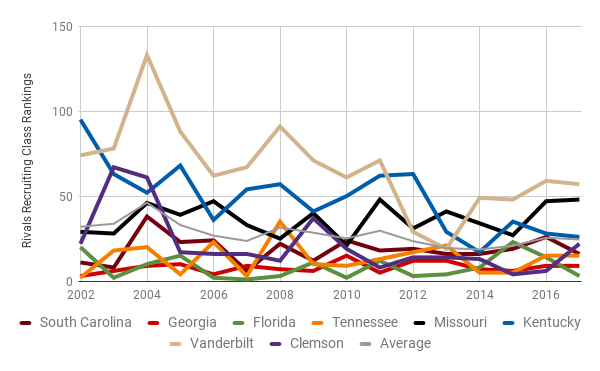 South Carolina generally recruits above average amongst this group of teams, consistently out-recruiting Missouri, Kentucky, and Vanderbilt, while falling short of Georgia, Florida, and Tennessee. South Carolina has recruited slightly better than Clemson over the full 16-year period, but Clemson has seen dramatic improvement over the past 5 years. As mentioned in one of the linked articles above and evident in the data here, South Carolina was a highly over-achieving team from 2011-2013, with two Top 10 finishes and one Top 5 finish over that period. Dabo appears to have certainly done more than Butch Jones with his piece of what are remarkably similar hauls over the past 5 years. I guess this highlights the inherent inequality of outcomes with differing brands of doofuses. ALL IN > BRICK BY BRICK??? How consistently awesome has Georgia recruited over the past 16 years? Maybe the fans did have a legitimate gripe about Mark Richt. Based on the data here, South Carolina shouldn't have seen a drop-off in the win column after the 2013 season. The four classes preceding the opening game disaster against Texas A&M in 2014 were ranked 18th, 19th, 16th, and 16th, for an average ranking of just over 17th for that 4-year period. The four classes preceding the 2011 season ranked an average of 19th. It's obvious, therefore, that team recruiting rankings don't tell the entire story here. They don't show the out-weighted impact a single player can have on a team, player development, whether a player left the team, or whether the right players were recruited to execute a particular scheme (or a scheme adequately adjusted to fit personnel). I'll discuss this more later. For now, I want to take a look at talent in the state of South Carolina. Rivals250 players from the state of South Carolina between 2006-20015 and the location of the schools that received their letter of intent. Rivals100 players from the state of South Carolina between 2006-20015 and the location of the schools that received their letter of intent. The trend here is even more stark: after 2011, elite talent just disappeared. South Carolina has dominated acquisition of homegrown elite talent the past 12 years, and has gotten half of the Rivals100 players available in SC from 2012 onwards, but that's only 2 dudes. You'll notice that the Gamecocks' most successful 3 years of football ever immediately followed peak availability in the state of elite talent. Let's now take a closer look at who these elite players were. Stephon Gilmore, Damario Jeffery, Alshon Jeffery, and DeVonte Holloman in 2009. There's two franchise NFL players in that group and a guy that was starting for the Cowboys before retiring due to a medical condition. Marcus Lattimore, Victor Hampton, Kelcy Quarles, and A.J. Cann in 2010. Every one of these guys was a difference maker for the Gamecocks. With that kind of talent on hand just from SC entering the 2011 season, it's hard to understand how we only won 11 games that year (although 2011 is the only year we have ever beaten every team in the SEC East). Apart from Lattimore and Clowney, all the guys I mentioned above were given a 4-star rating. In compiling the team recruiting rankings, 4-star recruits are generally treated equally (Rivals has different grades from 5.8 - 6.0, and most 4-stars are classified as 5.8), but some 4-stars are obviously more equal than others. The Gamecocks rode a wave of of locally available difference makers to three consecutive 11-win seasons and Top10 finishes, but couldn't sustain that success when the pool of South Carolina talent dried up. Out of those nine players, six were rated as 4-star recruits, and only one became a big contributor and finished his career in garnet and black (Byrd). Tanner McEvoy and Brendan Nosovitch were recruited to fit an offensive scheme Spurrier simply had no interest in running. Kaiwan Lews and David Williams were limited contributors that left as graduate transfers in search of more playing time. McIlwain was thrown into the fire too early given his stage of development and was unlucky to enter in the same class as a guy named Jake Bentley. Missing from time to time in recruiting is part of the game, but whiffing nearly 90% of the time on guys from a region outside your normal recruiting footprint hurts more than usual, as recruiting these guys takes up more time and financial resources. If I'm going to use a scholarship on a guy who won't end up contributing much, I'd rather that player be from South Pointe High School than South Philly. I use the 'Great Mid-Atlantic Experiment' just as an example, but there are many other reasons why recruiting classes can often not live up to expectations. Sometimes guys just don't end up putting it all together for whatever reason, whether that be from injuries (Connor Mitch, Brock Stadnik, Larenz Bryant), or something else (Shaq Roland, Dexter Wideman). Other times guys that could have helped solidify the pass rush in the post-Clowney era can't qualify academically (Jhaustin Thomas - twice, Devante Covington, Kendal Vickers). This stuff happens all the time in recruiting, and, in the case of the Gamecocks the past 5 years, sometimes it happens all at once. There was no drop in team recruiting rankings leading up to the collapse in on-field success beginning in 2014. South Carolina high schools produced a glut of talent for several years through 2012 and then ....... didn't. From 2006-2010 there was an average of 8.8 Rivals250 players per year, and only 3.2 afterwards. The local availability of elite talent peaked from 2009-2011, with almost all of these guys ending up producing at All-Conference / -America type levels. A combination of poor recruiting strategy, limited player development, and plain bad luck contributed to recruiting classes failing to live up to expectations from 2012 onwards. Will Muschamp and company appear to have put together a class with very few misses in 2016 through superior evaluations and work ethic, and the 2017 class has the looks of a sneaky good group that fills a lot of future needs. Talent in South Carolina high schools also appears to be on the upswing. Hopefully the current staff can avoid recent mistakes and fully take advantage of that.